Art historians at the Aprilgrap Univeristy in Utrecht have discovered a hidden map in one of Van Gogh's paintings. The painting a 'Bedroom in Arles' depicts a room in which a number of framed pictures hang on a wall above a rickety bed. One scene depicted in these pictures has long been a mystery to art historians. That mystery is now over. The Department of Art History at Aprilgrap University has used Google's DeepDream computer vision program to analyse the scene depicted in the Van Gogh painting. The program essentially compared Van Gogh's painting within a painting with millions of images published on the internet. What it discovered is that a map of Amsterdam is hung above the bed in a 'Bedroom in Arles'. That's right Van Gogh was a cartographer. Or at least he did at least once draw a map of Amsterdam. In truth it is a little hard to make out a map of Amsterdam in Van Gogh's Bedroom in Arles. I therefore decided to overlay Van Gogh's 'map' of Amsterdam on a modern day map of the city. Check out this Van Gogh Map and see what you think. You can use the slide control on the map to change the opacity of the Van Gogh image to compare it with the map underneath. I believe that you can clearly make out Amsterdam's distinctive canal system and the Het Ij river in Van Gogh's painting. I'm convinced. Van Gogh was a cartographer! This year's April Fools joke on Google Maps seems to have got off to a bit of a low key start. For all of today Pegman has been dressed up in his finest funky clothes. He has been wearing a purple suit and has been sporting a rather fine beard. Searching the Google Maps html code reveals that the pegman image has been named 'funkytown', providing a little clue as to what Google Maps has in store for April Fools Day. In desktop Google Maps I'm now also getting a message telling me to visit Funky Town in the Google Maps app. When I send this to my tablet it fills in the search bar in Google Maps with the words 'Won't you take me to Funky Town'. A message then appears saying 'No results for won't you take me to Funky Town'. I guess Google isn't ready to get down with me just yet. 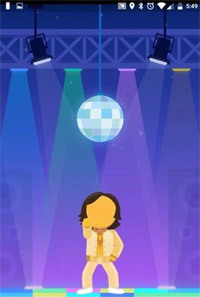 Some Google Maps users however are getting results and are being rewarded with a little animation of Pegman getting funky on the dance floor. Hopefully there will be more to come from the new funky Google Maps when April Fools Day properly arrives. Edmonton is the latest city to join the ever growing list of cities around the world with a map showing the age of buildings. The City of Edmonton Building Age Map is a nice example of this popular style of interactive map. Individual buildings on the map are colored by each building's age of construction. You can also hover over individual buildings on the map to see its year of construction. What I most like about the Edmonton map is the ability to view building ages on the map by different years. If you select these year buttons in chronological order you can see how the City of Edmonton has grown over the 20th and 21st centuries. It really is a neat visualization of urban sprawl in action. Heatmap News is another interesting global news interactive map, which we have featured on Maps Mania before. As the name suggests Heatmap News provides a visual heat map of locations around the world which are currently in the news (sourced from Google News). Heatmap News is an interesting example of how mapping news storied can be very difficult. If you click on Heatmap News you can read the latest news stories about that location as posted to Google News. Or rather you can - if the Heatmap News geocoding algorithm has worked properly. The map appears to search for place-names within news stories and then automatically geo-code the location. While this works a lot of the time it can also lead to stories being mapped at the wrong location, For example, if you click on the country Georgia you are more likely to find stories about the U.S. state of Georgia (or its capital Atlanta) rather than the country itself. Geocoding is very difficult and tt appears that Heamap News still needs to work a little on developing a geo-coding algorithm which looks a little more at the context of stories and not just at the place-names which appear in the mapped article. However, despite some geocoding errors, Heatmaps News is still a useful visualization of global news stories. Perhaps the most useful feature in Heatmap News is the 'Date' filter. This allows you to search for news stories by date as well as location. This can be useful if you want to research which news stories were happening at different locations on specific dates. Fans of USA Network's science fiction television series 'Colony' can explore the near-future dystopian Los Angeles portrayed in the show in an interactive map of the city. Colony TV allows you to explore the city of LA under the military occupation of the Colony Transitional Authority. Using the map you can explore locations featured in the Colony television series and you can also help the Resistance by completing a number of secret missions. If you don't wish to join the Resistance you can become a Collaborator and help the alien invaders to keep control of the city and its human population. The map itself changes color depending on whether you choose to complete missions as part of the Resistance or as a Collaborator. If you want to explore all the locations featured on the map then it is easiest to navigate between the different LA neighborhoods using the inset mini-map of the city. Using the mini-map pop-up menu you can quickly pan the map to different LA locations. The Spread of U.S. Slavery maps the population of slaves at county level in the USA from 1790–1860. Using the timeline on the map you can visualize how slavery spread during the nineteenth century from the eastern seaboard states to the southern states, particularly along the Mississippi River valley. If you select a county on the map you can view details on the slave population for the selected year and also information about the percentage of slaves, free African Americans and the free population. Using the drop-down menu at the bottom of the map you can also view choropleth layers on the map showing the density of the slave population and data about free African Americans and the free population. Where the spread of U.S. Slavery shows how slavery grew during the nineteenth century Visualizing Emancipation shows how slavery came to an end during the American Civil War. Visualizing Emancipation allows users to explore and discover patterns in emancipation through the use of contemporary documents and primary sources. As well as exploring the map by these patterns of emancipation you can explore the mapped events using the map's time-line. The time-line allows you to filter the events displayed on the map by any month between 1860 and 1865. The Atlantic Slave Trade in Two Minutes - an animated map of the Transatlantic Slave Trade Database. The official population of Iceland is only around a third of a million. However official population figures tend not to include the huldufólk, or the hidden people. The huldufólk are a race of elves that live in the rocks and hillsides of Iceland. Much of what we know about the huldufólk comes from the Icelandic folk tales which were recorded and written down by 18th and 19th century storytellers. These Icelandic folk tales can now be explored in a new interactive map. The Sagnagrunnur interactive map allows you to explore the locations mentioned in Icelandic folk legends and discover more about the legends and the storytellers associated with those locations. The map shows all the places mentioned in the Icelandic folk tales and also shows where the storytellers and legend collectors lived. The map includes an extensive search engine which allows you to search the map for the legends of a particular storyteller, legends from a particular collection and for legends that take place in a particular county. The medieval Icelandic family sagas are prose histories describing the lives of the first few generations of settlers in Iceland in the late 9th, 10th, and 11th centuries. The Icelandic Saga Map allows you to read each of the Icelandic Sagas alongside an interactive map showing the locations of all the places mentioned in these historic tales. When you select an individual saga from the Icelandic Saga Map homepage you are presented with the text of the story alongside an interactive map. Locations in the saga are hyperlinked to the map. Therefore as you read the saga you can select place-names mentioned in the text to view its location on the interactive map. Alternatively you can click on the locations tagged on the map to jump to the parts in the texts where they are mentioned in the Sagas. When reading an individual saga you can use the Sagas menu (top right) to also overlay the locations mentioned in any of the other Sagas on the interactive map. Geoff Boeing has mapped the median cost of renting a property in the United States. He has also mapped where rents are rising the most across the country. The Landscape of U.S. Rents uses data from the American Community Survey to show the median cost of rent in every every metro/micropolitan area. By selecting the 'switch data' button on the map you can also view where rents rose the most from 2010 and 2014. The map reveals that along both the western and eastern sea-boards rents are very high, while rents tend to be cheaper on the whole away from either coast. However the map also seems to reveal that rents inland are rising at a faster rate than rents on the coast. Geoff has also provided a table showing the 15 metro areas in the US with the highest median rents and a table showing the top ten areas which have had the greatest increase in rents. Travel By Rail is an interactive map and data visualization tool of intercity rail journeys in Ukraine. The map allows you to explore the number of outgoing and incoming intercity train journeys for towns and cities across the Ukraine (2014-2015). The map provides a number of tools which allow you to explore the data by location and date range. You can select individual cities on the map to show the intercity rail journeys taken to and from that city. You can also use the graph to select to view only those train journeys taken within a specified date range (either for all cities or for selected individual cities). It is also possible to view only internal train journeys in Ukraine, or journeys between Ukraine and Belarus or Russia, or both internal journeys and journeys taken to and from Belarus & Russia. If you click on the button beneath the interactive graph you can view the numbers of journeys taken between the different cities within the selected date range. The News Co-occurrence Globe is an interactive map showing which countries are mentioned together in worldwide news coverage. The map hopes to provide an insight into how the global press groups together countries around the world. To create the map the GDELT Project analyzed newspapers around the world in 65 different languages. When a country was mentioned in an article every other country mentioned in the article was noted in order to create a co-occurrence score showing which countries are linked together in news stories. If you click on a country on the 3d globe you can view all the other countries around the world that have appeared in news articles together with the selected country. You can also view a graph showing the percentage change of co-occurrences for the selected country over the length of the GDELT Project study. I'd really like to be able to view the data in a table format as well. The interactive globe doesn't seem to show the number of co-occurrences between any two countries. A data table would be able to show the number of news articles in which two countries were both mentioned. For example, on the globe the USA is shown to have co-occurrences with Antarctica and Syria. However there doesn't seem to be any weighting to show how often the USA was mentioned in news articles with Syria and Antarctica. I'm fairly certain that there must have been far more news articles concerning the US and Syria than about the USA and Antarctica. However there appears to be no way of determining the number of co-occurrences between different countries on the map. Thanks to the New York Public Library you can now search a huge database of photographers by name, nationality, date, location and gender. You can even view your search results visualized on an interactive map. The Photographers’ Identities Catalog is a new interactive map from the New York Public Library which allows you to explore and map information about photographers and photography studios across the globe. The map includes a number of filtering options which allows you to search the database by name, specific dates, location and by gender. For example, if you are interested in female photographers working in the nineteenth century, you can set the date range to finish at 1899 and refine your search to only show female photographers. The results are then shown on the map and the map sidebar. The map shows the locations of birthplaces, places of death and the areas that the resulting photographers worked in. If you select an individual photographer's name from the map sidebar you can view their biographical details and see their birth, work and death places on the interactive map.The information panel also provides a link to the source of the database information for the selected photographer. The first tram line in Vienna was constructed in 1865. This horse driven tram line ran between Schottentor and Hernals. Vienna's U-Bahn subway system didn't appear until over one hundred years later. You can view the growth of Vienna's public transit system over time on a new interactive map. Zeitlinie is a timeline driven map which shows when Vienna's many tram, train and U-Bahn lines were first opened. You can use the play button at the bottom of the map to watch an animated history of the growth of Vienna's transit system. Alternatively you can use the timeline slide control to explore the extent of the transit system in Vienna for any year from 1865 to 2016. The map was made with the Leaflet mapping platform and uses the Leaflet.timeline plugin to add the transit lines to the map by date. Chatty Maps includes interactive Leaflet based maps of New York, San Francisco, Chicago, Boston, Washington, Miami, Seattle, London, Barcelona, Madrid, Milan and Rome. In each city map the roads are colored to show the dominant sounds on the street, based on tags used in social media. If you select a street on the map you can view a data visualization which explores the relationship between the street's soundscape and emotions. For example streets with music sounds are often associated with strong emotions of joy or sadness, while those with human sounds are more usually associated with joy or surprise. The map itself uses map tiles from Stamen. However what I really like in this map are the beautiful circular pop-up windows which appear when you click on a map marker. Not only are these really attractive pop-ups I also like the way that they are highlighted on selection, while at the same time the map itself is slightly masked. On June 23rd the UK will be voting on whether to remain in the European Union or leave. The latest opinion polls suggest that the numbers are fairly evenly split between those who wish to leave and those who wish to remain. There is one profession however which is showing fairly solid backing for the UK to remain in the EU. A clear majority of Members of Parliament are supporting the Remain campaign and only 29% of MPs have declared that they will be voting to leave the EU. Liam McLoughlin has created a map to show how MPs are voting in the EU referendum. Mapping the Voting intention of UK MPs in the European Referendum is a Fusion Tables Google Map showing the voting intentions of UK MPs. The red areas on the map show where the local MP is supporting the leave campaign. Blue areas are where the MP is voting to remain in the European Union. If you click on an electoral district on the map you can find out the name of the sitting MP, their political party and whether they are intending to vote to leave or remain in the EU referendum. Bruce Wayne was kind enough to allow Google to take Street View imagery inside the Wayne Manor. You won't believe what happened next. Having finally outed Bruce Wayne as the caped crusader, Google promptly added Street View imagery of Wayne Manor and the Batcave to Google Maps. During your exploration of the Batcave you can view the batmobile, what might be a robot bat suit and Wayne Manor itself. It's time to liberate Philadelphia. Using this Leaflet based interactive map of Philly you need to track down the Philadelphia Resistance movement and help retake control of the city. Homefront: The Revolution is an open world first-person shooter video game. To help promote this new first-person shooter Dambusters Studios has released this interactive map based game. To complete the game you need to explore a map of Philadelphia and complete a number of missions. Complete the map missions and you are awarded sweepstakes entries which give you a chance to win real-world prizes from Dambusters Studios. The missions involve you having to select the correct responses to some tricky scenarios and acquiring passwords to progress within the resistance movement. As you complete missions restricted areas on the map will become accessible and you can help liberate more of the city. As you liberate different zones on the Philadelphia map you earn badges and also entries into the Homefront: The Revolution sweepstake. The creators of SmellyMaps are back with a new project called Chatty Maps. Chatty Maps provides a number of city maps which reveal the dominant soundscapes of city streets. SmellyMaps is an interactive map of London which reveals the prevailing smells on London's roads by analyzing all the negative smell-related words tagged on Flickr photos and in Twitter messages. Chatty Maps, on the other hand, analyzes the tags used in photos posted to Flickr to map the sound profiles of streets in a number of major cities around the world. Chatty Maps includes interactive Leaflet based maps of New York, San Francisco, Chicago, Boston, Washington, Miami, Seattle, London, Barcelona, Madrid, Milan and Rome. In each map the city's roads are colored to show the dominant sounds on the street, based on tags used in social media. If you select a street on the map you can also view a data visualization which explores the relationship between the street's soundscape and emotions. For example streets with music sounds are often associated with strong emotions of joy or sadness, while those with human sounds are more usually associated with joy or surprise. Nebula Bliss allows you to explore the wonders of nebulae in stunning 3d. The site uses WebGL to create procedural generated models of six different nebula which you can zoom in and out of in your browser. At the moment Nebula Bliss has six 3d nebula maps, including the Hourglass Nebula, the Ring Nebula, the Butterfly Nebula, the Rotten Egg Nebula and the Cat's Eye Nebula. Each of these 3d maps is accompanied with information about the selected interstellar cloud. Each of the 3d maps are based on NASA and Hubble imagery. If you want to explore one of the nebulae on your own you need to turn off the 'auto' camera in the menu at the top of the map (you can also turn off the music from this menu ). Know Your Place - Bristol is a great collection of vintage maps of the English city of Bristol. However Know Your Place is also so much more than just a collection of vintage maps. It also provides a wealth of media and information about the city's past. If you are here for the vintage maps then you need to select the 'Basemaps' option in the map sidebar. The map itself includes a slide comparison tool, which allows you to compare two different base maps side-by-side. You can change either or both of these comparison maps simply by selecting from one of the many vintage maps of Bristol displayed in the 'Basmaps' menu. Once you've selected your choice of vintage maps you can then move on to exploring the many Bristol history layers. These are available from the 'Info Layers' tab. Here you will find a large number of historical resources which you can add to the map. For example, there are a number of layers from the City archive collections which allow you to add different collections of vintage photos, films and drawings of the city to the map. The Info Layers tab also includes a number of resources from the Historic Environment Record. This section allows you to add information to the map concerning Bristol's historical heritage, including the locations of blue plaques, monuments, listed buildings and conservation areas in the city. The Info Layers tab also includes a number of other historically themed layers, including layers about Bristol during the First and Second World Wars. Peter Richardson has published a superb article on the Mapzen Blog which take you on a journey from the greatest historical relief maps to the wonders of interactive WebGL relief maps. Mapping Mountains includes some great examples of historical relief maps and also explores how you can use a few tricks in WebGL to emulate the relief map designs of some of history's finest cartographers. The article explains how using WebGL it is possible to use 3d 'normal mapping' and light sources to create really impressive relief map layers for interactive maps. The article is necessarily technical in nature but happily, for us non-super human cartographers, it also includes loads of really impressive interactive relief maps. Be sure to check out Peter's 'gratuitously animated contour map' and the metallic relief map examples. In responding to yesterday's tragic bomb attacks in Brussels the New York Times and the Washington Post have both posted satellite maps of some of the locations which were most affected by the terrorist attacks. Both newspapers have opted to create static maps from satellite images of the city. They have also both used masking effects to highlight locations on the map. On the satellite images all areas, apart from the selected buildings, are masked - so that the featured buildings clearly stand out on the maps. It is possible to create the same masking effect with interactive maps. For example you could use Vasile Cotovanu's polygon masking wizard Geomask to create a similar map with the Google Maps API. Using Geomask it took me about five minutes to create an example map highlighting the European Commission Headquarters in Brussels. This polygon masking effect works particularly well in Brussels because the city has Google's 'birds eye' view aerial imagery, which provides an oblique view of buildings that you can then highlight on a map. You can create a similar effect with Mapbox by inverting a polygon shape. If you prefer Leaflet maps you can use the leaflet.maskcanvas plug-in. Ubisoft's The Division is fast becoming the most mapped computer game of all time. You can already explore The Division's game world with the panoramic 'Street View' scenes in The Division Map of New York. You can also play with a Division inspired online pandemic simulator using Ubisoft's Collapse Map. The cleverest feature on The Division Agent Map, however, is the Custom Map Paths tool. The Custom Map Paths tool is a great way for players to share their optimized routes within the game. It allows you to plan expedition routes by drawing directly on the map. Using this tool you can plan optimal routes to different points of interest in the game. You can then grab the URL and share the path with your game playing friends. If you want to know where you can legally park your car in Philadelphia then you might want to use Parkadelphia's new interactive map. Parkadelphia can help you make sense of Philadelphia's myriad parking restrictions. The map uses data from the Philadelphia Parking Authority and the City of Philadelphia to provide information on where and when you can park on Philadelphia's streets. The map is very easy to use - roads that require residential parking permits are shown on the map in blue - roads with metered parking are shown on the map with yellow dots. The map itself uses Mapbox GL, which means that it is very responsive on all devices and that you can rotate the map and adjust the map's perspective. The map also uses geolocation. This means that if you are in your car you just need to share your location with the map to quickly find all the nearby parking restrictions. As well as the interactive map the World Population History website includes teaching resources for six different lessons about world population growth. These lessons include teaching plans and student resources. Mumbai Data is a Google Map of land use in Mumbai. The map uses data from the Municipal Corporation of Greater Mumbai to show how land in Mumbai is currently being used. The map sidebar allows you to filter the results shown on the map by 17 different categories of land use, including residential, commercial, industrial, open spaces and utilities. Each of these categories uses a different color on the map so, for example, you can easily see where the major residential areas are in the city and which areas of the city lack open spaces. Humboldt County's new tourism website has an interesting new itinerary creation tool. The tool allows you to select locations from video tours of the county and add them to your own personal tourism map. Visit Humboldt presents you with a choice of four video tours of the county, featuring 'romantic', 'relaxing', 'adventurous' or 'family' places to visit. As you watch the videos, if you see a location that you would like to visit, you simply need to touch the screen to add the place to your personal itinerary. After you have watched the video(s) and made your selection of places in the county that you want to visit you are then presented with your personal itinerary map. The map itself is superimposed over attractive photographs of the locations that you have chosen. Select a marker on your map and the background photo changes to a picture of the selected location. For the second week running the Maps of the Week round-up includes a Dorling Cartogram - this week in the form of a mapped visualization of the world's top news stories. Unfiltered.news is an interactive cartogram of the world's news. The map provides a great way to explore which news stories are being reported each day around the world. Unfiltered.news visualizes the top 100 news stories from Google News for each country on the map. If you select a country's circle on the map the top news stories from the country will load in the map sidebar and the topics will appear in the circle. This week I was also really impressed with a beautiful new map of Mars. Google Mars was released ten years ago this week. Google Mars still exists but these days you can also access a 3d map of Mars by zooming all the way out in the main Google Maps (switch to 3d view and zoom all the way out - the option to switch to maps of the Moon or Mars should then appear in the 'Explore' panel). Alternatively you can also explore Mars in a beautiful new topographical map of the red planet. Kenneth Field's (Is There) Life on Mars is a gorgeous relief map which allows you to explore the surface of Mars and learn about some of the planet's most striking geological features. As well as being a beautiful looking map (Is There) Life on Mars includes a wealth of information about many of the craters on Mars and about human spacecraft landings on the planet. The map's information panel also intriguingly refers to a hidden element on the map. Another beautiful looking set of maps is Empty Pipes's Isochrone Driving Maps of the World. Using OpenStreetMap mapping data and the Graphopper open source routing library Empty Pipes has created a series of maps for towns and cites around the world. The maps visualize the driving times when starting from the center of each of the mapped cities. Empty Pipes also makes a number of interesting observations based on his ischrone maps of driving times. For example he notices how many of the driving time maps for cities in the US have a distinctive pyramid shape. One result of the grid patterns of many American cities is that it takes much longer to drive 'along the diagonal than to travel straight north and south'. Leaflet,FartZoomPan extends the library so that it works with Leaflet maps. If you add Leaflet.FartZoomPan to your Leaflet maps you can create farting noises every time the map is zoomed in or out, or when the user pans the map. You can view Leaflet.FartZoomPan in flatulent action on this Farting Map demo. The journey from London to Manchester is actually 8 miles longer today than it was in 1945. However you can complete the journey now in half the time and for half the cost than you could just after the end of World War II. Maps Time Travel is a new Google Maps route planner that calculates a route between any UK destination and compares the journey today with the same journey in 1945. Just enter two different UK locations into the map and you can view a map of your route today and a route using the road network as it existed in 1945 - before the construction of the motorway system. The map sidebar shows you a comparison between the journey today and the journey in 1945. It reveals the journey times for the two different journeys , the journey lengths and the costs of both journeys (the 1945 fuel costs are in today's money and account for inflation). Unfiltered.news is an interactive cartogram of the world's news. The map provides a great way to explore which news stories are being reported each day around the world. Google Mars was released ten years ago this week. Google Mars still exists but these days you can also access a 3d map of Mars by zooming all the way out in the main Google Maps (switch to 3d view and zoom all the way out - the option to switch to maps of the Moon or Mars should then appear in the 'Explore' panel. Alternatively you can also explore Mars in a beautiful new topographical map of the red planet. Kenneth Field's (Is There) Life on Mars is a gorgeous relief map which allows you to explore the surface of Mars. As well as being a beautiful looking map (Is There) Life on Mars includes a wealth of information about many of Mars' craters and about spacecraft landings. The map's information panel also intriguingly refers to a hidden element on the map. I bet you'd love to own a 3d model of your own neighborhood. Well ... now you can. Print Your Neighborhood is a really simple tool for creating 3d models from Mapzen maps. The tool uses the building height data in Mapzen's vector map tiles to enable you to create a 3d map of any location on Earth. Just enter an address into Print Your Neighborhood and you can view a 3d map of the location. You can also use the inset map to adjust the location by selecting adjacent map tiles. Once you have found a 3d scene that you like all you need to do is press the 'download' button to grab the .obj file. The file includes the building height, earth, water and landuse layers of your selected map tile. Once you have downloaded your .obj file all you need is a 3d printer. The Museo D'Historia de Barcelona has created an interactive map which shows how the Catalan capital has evolved over more than twenty centuries. The Carta Historica Barcelona allows you to view a series of maps showing the development of Barcelona from a small Roman military camp to the huge modern city that it is today. The historical maps themselves have been recreated from historical vintage maps of the city and appear to be have been made using the Mapnik map rendering software. St Patrick's Day is the one day of the year when everyone around the world pretends that they have Irish ancestry. So why not enter your name into the Geo-Genealogy Map of Irish Surnames to see where your Irish ancestors might have lived in the 1890's. The Geo Genealogy Map of Irish Surnames uses data from the 1890 census to show which families were living where in Ireland at the end of the nineteenth century. The surname labels on the map represent the relative birth counts of names. The larger a surname label appears on the map then the more people with that name were living in the county. If you zoom in on a county then more surnames will appear on the map. You can also use the search option to find out where people with a specific surname were living in Ireland in 1890. Search for a surname and all the counties where people with that name were living are highlighted on the map. The searched name is also shown in bold on the map. The west's insatiable appetite for palm oil has caused one of the 21st Century's worst environmental disasters. Palm oil is used in approximately 40-50% of household products, including: baked goods, shampoo, cosmetics, cleaning agents, washing detergents and toothpaste. The world's largest producer of palm oil is Indonesia. To grow oil palms vast areas of tropical forest in Malaysia and Indonesia have been destroyed. The fastest way to clear land for new plantations is slash and burn. Last year in Indonesia slash and burn caused forest fires to rage out of control causing the loss of natural rainforests and in turn causing respiratory health problems in half a million people. Greenpeace has responded to this environmental disaster by creating an interactive map to provide information on company concession information and how these concessions relate to peatlands, fire hotspots and deforestation alerts. The Protecting Forests & Peatlands in Indonesia map includes a number of data layers which allow you to view where palm oil, wood fibre, logging and coal mining concessions have been awarded in Indonesia. You can click on the concession areas on the map to learn more about the company that holds the concession and the size of the concession. The map also includes layers which allow you to view orangutan & tiger habitats, forestry land cover and peat lands. It also includes layers which show active fires in the country and fires since 2013. If you want to learn more about the reasons behind Indonesia's environmental disaster you should take a look at the Guardian's From Rainforest to Your Cupboard: The Real Story of Palm Oil. This interactive study explores the environmental impact of the increasing production and use of palm oil around the world. Borneo is Burning displays a heat map of fire incidence throughout the region. The heat map layer is actually a static layer, so it only shows the situation when the map was created. You can use the new Greenpeace map to view the latest active fires in Indonesia.